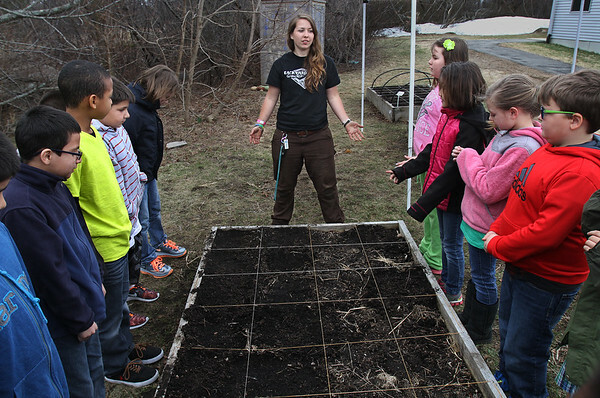 Meghan Stratton of Backyard Growers explains to a group of third graders how to plant vegetables Friday at Beeman Elementary School in Gloucester. Backyard Growers, a grassroots organization dedicated to reshaping Gloucester's relationship to food, visited all five elementary schools last week to help students with the project. The children planted various types of greens that they will harvest and eat in June. Planting the seeds and watching the vegetables grow gives the children a vested interest in healthy food, said Stratton, school programs manager at Backyard Growers. "A lot of kids will say they don't like salad greens," Stratton said. "But if they grow it themselves, one hundred percent of them will eat it." And many find that they like it.